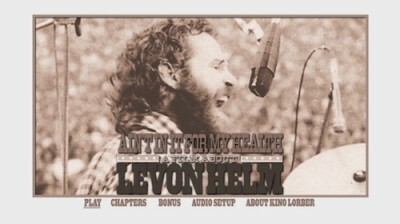 The central conceit of Ain’t In it for My Health, the documentary of The Band’s recently deceased drummer, Levon Helm, is that its subject is compelling enough to sustain interest in his daily chatter, visits to the hospital and scattered observations. It’s not. Still, I was game. Helm’s issues with The Band and posterity’s treatment of same could be interesting. Of Robertson, Manuel, Danko and Hudson, their travels and impact, Helms says that . . . . “the credits and the money” on the third Band record was a “screw job” (Robertson was the writer and got the royalties) and after that, well, it was pretty much all over. That’s the whole of it. Otherwise, Helm just broods and ambles and lounges amongst younger acolytes (including Billy Bob Thornton) and these scenes are interspersed with nature photography of Helm’s property in Woodstock, NY. Near the end, surviving wives and girlfriends tell us that the real downfall of The Band was drugs and alcohol.